Last week I used the A580 for a couple of outdoor (curbside cover-type images) real estate jobs and noticed the nice processing of HDR with ghosting artifacts removal, like tree branches moving around from shot-to-shot. I might work up a page showing the differences in processing between sony and Photomatix pro 4.0. For some shots I used HDR 3.0ev, and was surprised at the well-balanced outcome. The Reader's Digest page will not be updated much, if at all in the near future. It takes just a little too much time to go through and post the responses, while I have a huge amount of new stuff I'm working on to help people with their photography, so I think that's a better use of my limited time. I added the Sony Carl Zeiss 16-80mm to the recommended gear page, I use that lens for outdoor real estate shots (as mentioned above), because of the high quality optics, and great zoom range. 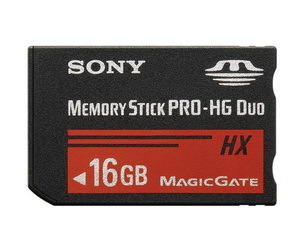 I might soon add a few memory cards to the list as I bought two Sony MemoryStick pro HG duo HX (now $50) recently for use in the A900/A700/A580, and find they work great. Although not ready yet, prep yourselves for an interesting comparison between the telephoto lenses below. I'm fortunate enough to have all four in the stable right now. I get mail almost daily from people that want to see how the Tamron and two sigmas (OS HSM and HSM) hold up against the Sony. I'm currently finishing up the Tamron review, and hope to have it ready early next week, followed by the two Sigmas, and then I'll post the comparison review shortly thereafter. 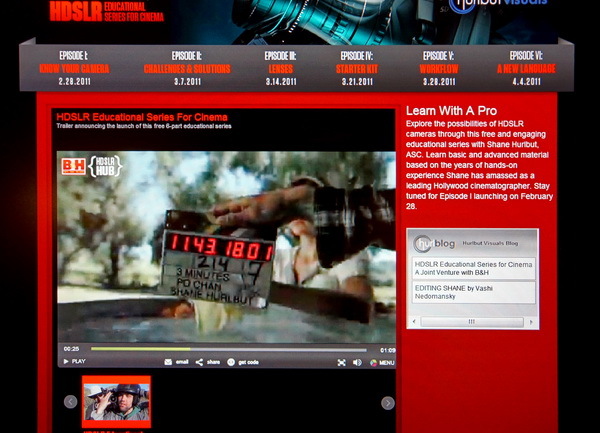 If you're interested in shooting HD video from your DSLR, you'll want to check out the site below and watch the trailer. Video has never really been my thing, but what Shane Hurlbut has presented so far looks pretty cool, and may give me some motivation to try and produce something interesting with the Sony A580. It looks like there will be six educational episodes to watch, coming at one per week, starting on Monday. There's no cost to view. I see the NEX-3 is being discontinued in Japan, and likely everywhere else soon. That's probably why it's on sale now (until 3/5/11) with a bunch of freebies like a 4gb card and carrying case, plus free shipping in the US. The Tamron 28-75mm F/2.8 made it to the most popular pages, due to rising interest. It's $474 with rebate through April. 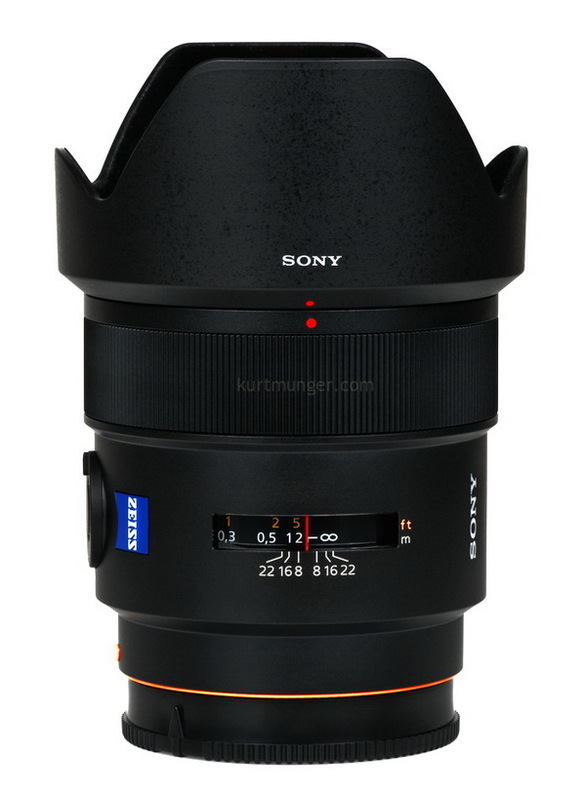 Don't forget the more expensive, but much better built (and wider) Sony CZ 24-70mm F/2.8. Anyone interested in looking at boring ISO crops? well, there's a lot of chatter in various Sony forums about the ISO performance of the new A580, so I thought I'd provide some side-by-side ISO comparisons of Sony's flagship A900, the old and outdated A700, and last, but not least, the new A580. The A580 received rave reviews about its high ISO performance when it was introduced, so how does it stack up to the older Sony cameras from the last decade? In a nut-shell, you'll see about a full stop ISO advantage with the A580 when displayed side-by-side with the A700 (using firmware ver. 4), and factoring in the extra resolution of the A580. There are three sets of ISO comps on the page. The top set shows ISO center crops from the A580 and A700, with the current Ver. 4 firmware. The second set has the same A580 crops on the left, but with the A900 crops now in the right column. The last set has the A700 with Ver. 3 on the left, and the most current Ver. 4 on the right (as of this review, 2/11). More info on the page introduction. The Sony A580 starts to really shine at very high sensitivities, and appears to out-resolve the A900 at ISO 6400, while holding better color, that's somewhat surprising, but shows how noise reduction and sensor technology have progressed in two plus years since the A900 was introduced. 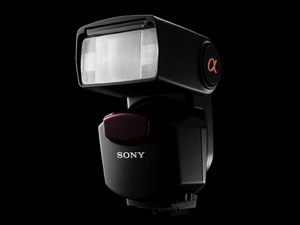 A few people claim Sony added better noise reduction to the A900 with the new firmware update. I updated my A900 to ver. 2.00, and noticed no difference at all. Sony says there is no modification to noise reduction in this firmware (Ver. 2.00) and I can confirm that. Check out the minor site make-over, the second column is new, it's only on the homepage though. I'm trying to make the site more user friendly, with quicker access to the most popular pages, and more useful camera and accessories links, which you should notice in red text at the top right. This is the 3rd, and last version of this website, with a whole new site coming later in the year. You probably noticed I dropped the blog, I thought updating two sites with the same info isn't a good use of time IMHO, although it did offer visitor comments. Well, that'll be available on the new site. If you're wondering what happened to the Sony and Minolta off-camera flash page, it wound up going to the January homepage archives, without a link on the homepage, sorry. I have a picture link now on the right. Some people are telling me they're seeing the same soft mid-sections as I reported on the CZ 24/2 review, and some are saying quality control is spotty on that lens, and I got a bad copy. I've had really good luck with quality control on Sony lenses, but there's always a possibility that something is mis-aligned or out of adjustment on a few samples. I think I'll wait for the shelves to clear of the current batch, then try another copy after Sony finishes a second run, and see what happens. I'd like to mention too, that shooting test charts may not show the same results as focusing on something farther away, say 10' (3m) or more. You may have noticed nothing new has been added to the Reader's Digest page lately; I'm so busy generating new articles and reviews I'm unfortunately having to neglect that part of the site. I always answer my mail, it just isn't being shared like I thought it should. 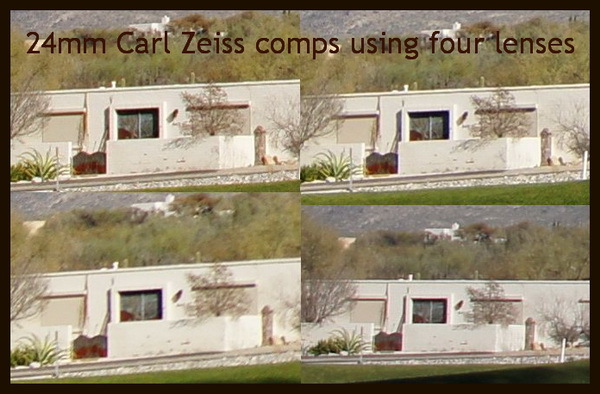 Many people are wondering how the Sony Carl Zeiss 24mm F/2 prime lens performs when compared directly to the Sony Carl Zeiss zooms (shown below) at 24mm. Fortunately, I own three of the four lenses, so I was able to work up a direct comparison. As always, you should not use the outcome here solely when making a purchasing decision. There are other factors that are sometimes far more important than sharpness or distortion. Heft, flare/ghosting control, focusing speeds and fast apertures are all very important too, it all depends on what works best for the photographer. Check out the 24mm wide angle comparison page now! Just a few updates for you; the Sony A900 body-only is out of stock nearly everywhere, (no surprise to me though), but the just-as-good A850 is in stock, plus save $200 on the Sony 28-75mm F/2.8. When I post the 24mm comps, you'll understand why I push these full framers if you're the type of person that demands the very best image quality. Also; if you buy any camera over $300, get $100 off the full version of lightroom 3. I did just that a year or two ago when I got version 2.7, it works great for processing your RAW files, and jacking your colors without turning it into a mess like simple saturation boosting does. In other news; Sonyalpharumors is reporting a Carl Zeiss 24mm F/1.7 is in the works for the NEX system, that would be great if it's true. 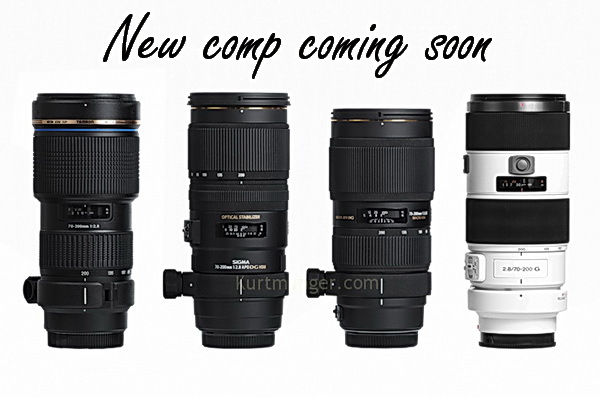 I mentioned the 24mm comp review above, which should be ready mid-week sometime, so stay tuned, you'll be surprised! The Sony Carl Zeiss 24mm F/2 SSM review is finished, check it out. I've never been one to toot my own horn, but I'll do it anyway, just this once, and mention that I've now reviewed all Sony "A" mount and "E" mount (NEX) lenses, for the full list, go here. Late last year Sony introduced a new Carl Zeiss wide-angle (called "Distagon" by CZ) full-frame lens (made in Japan) featuring a fast aperture of F/2. Not noticed by many, but it's actually the first prime lens for a Sony Carl Zeiss that uses the superb SSM, or "super-sonic wave motor" originally designed by Minolta. Hopefully, from now on, SSM will be featured in all "G" and "CZ" lenses. Performance wise, the Sony Carl Zeiss 24mm F/2 is super sharp in the centers, with plenty of contrast at F/2! The distortion curve is pretty flat. Light fall-off is very low on APS-C, although slightly harsh at F/2 on full frame, it clears up very quickly a stop down. Hand-held available light photographers that currently use the Minolta AF 28mm F/2, (which has massive and image ruining coma at F/2) will find the new Carl Zeiss to be far better at F/2. However, the new Zeiss lens is not flawless. I see plenty of ghosting when bright lights are in, or near the image edges. I also see some wavy field curvature, read about that in the conclusion. Stopped down hard, there is no problem, but at wide apertures it is noticeable. People not familiar with this issue may think they simply aren't getting the proper focus. The Sony Carl Zeiss 24m F/2 lens is expensive, but is it worth the price? It has some really good qualities, and a couple of flaws; it all depends on what's important to you. Based on some preliminary tests, I'd say if you own the CZ 16-35mm and/or CZ 24-70mm, and won't need F/2, then you probably wouldn't benefit from the CZ 24mm. However, F/2 is a whole stop faster than F/2.8, that's a big part of the extra expense, and very important for hand-held shooting in low light. Also, if you're a person that likes 24mm, and aren't interested, or not in need of a zoom, then by all means, try it out, it's a lot lighter and smaller than the CZ zooms mentioned. 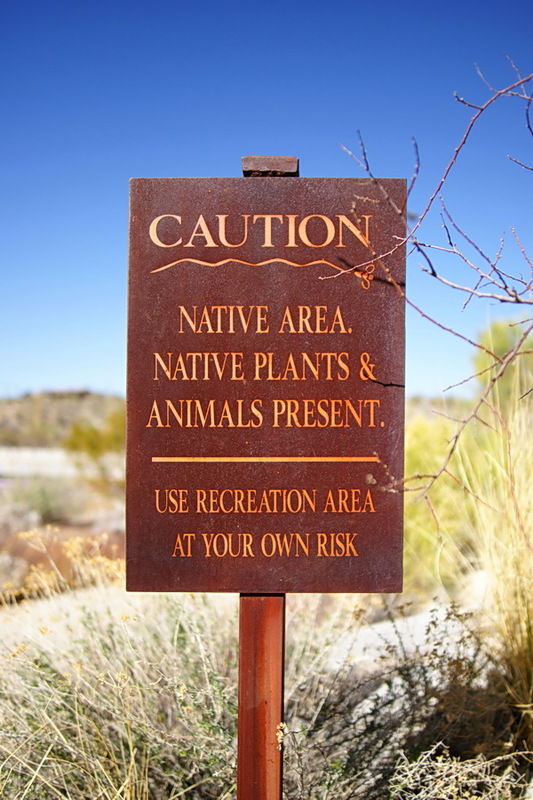 It's been a while since I've had a random thought, so here goes: while taking some test shots with the new Sony Carl Zeiss 24mm lens at a local hiking trail-head, I came upon this sign, which I'm assuming was erected by educated, important people of Oro Valley, AZ. In a nut-shell, it says you're entering a dangerous area, full of wild beasts, best not to walk here and hurt things, or yourself, turn around and go to the nearest shopping mall and walk there. I thought a better place for this type of sign, slightly re-worded, would be along the highway as you enter the city, and should read; Caution; polluted, people infested area ahead, criminals, crackpots and crazies present, use city at your own risk!! Well, whatever. I'm much more comfortable in the desert, at peace with the snakes, bobcats and scorpions than I am in a concrete jungle. Sony floats some new DSLR gear (and other stuff) at the CP+ show. I see a new flash, similar in design and operation to the HVL-F58AM, but I'm guessing less expensive, and meant to replace the HVL-F42AM, (used here) or possibly the discontinued HVL-F36AM. The camera and grip appear to be the same as what they showed last year, along with what I think is supposed to be an APS-C fast normal zoom, let's say a 16-50mm (24-75mm equiv) F/2.8, or maybe a 16-80mm (24-120mm) in the F/2.8 range. Sony Corporation announced today it will disclose the basic specifications of its "E-mount" for interchangeable single lens cameras, without fee, to manufacturers of lenses and mount adaptors, starting April 1, 2011. This opens the way for manufacturers of various lenses and mount adaptors to effectively develop products conforming to "E-mount" specifications. Users of the Sony's "NEX-3", "NEX-5", "NEX-VG10" and other "E-mount" compatible Sony digital imaging products to be launched in the future will now be able to use interchangeable lenses from both Sony and various other manufactures, while they will also be able to attach non-Sony lenses to their Sony digital imaging products via a mount adapter. Sony believes the growth of digital imaging products employing the "E-mount" will further increase the enjoyment of photography and video shooting among an even wider range of users. These basic specifications will be disclosed to manufactures of lenses and mount adaptors following a predefined process of approval and the signing a license agreement with Sony. In my opinion, after-market manufacturers (Zeiss, Sigma, tamron etc.) 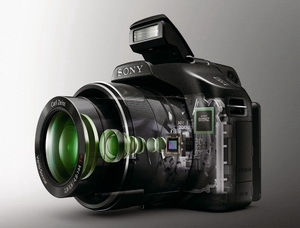 signing any agreement with Sony will receive all info for correct and complete operation on a Sony Camera. So we shall see! Sigma's 120-400mm F/4.5-5.6 DG APO OS HSM for Sony is now available at B&H photo. I haven't been able to review one yet, but hopefully I can later on this year. A reader named Anthony wrote and wondered about using the OS with Sony's Steadyshot simultaneously. I don't know how that would work, if at all. Anybody have any knowledge about that? Or which system is better? I'd like to check that out and write a comparison review. If you're in the market for a large capacity memory card, check out the stuff below. I bought two of the Sony 16gb Memorystick Pro HG duo HX ($53.08 each) a couple of months ago; they're fast, very reliable and provide about 428 RAW images (according to the LCD) with the A900, (I usually get more than that), or 1600 using fine Jpegs. I've never had a Sony Memorystick go bad, I have had troubles with other brands and types. 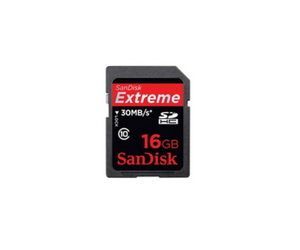 If you want a professional Extreme Sandisk 16mb card, and work under seriously harsh conditions, indulge yourself, they're on sale for $94.95 after mail-in rebate. Since I'm now deep into the Sony CZ 24mm F/2 SSM review, (which BTW, may be an excellent interior/architectural lens, and while we're on the subject), I thought I'd show you a shot I took on my first real estate job a few years ago. The home was listed for just south of $500k, and the interior was full of wall length mirrors, ---that folks--- is a nightmare of epic proportions for a first job, not to mention the results when you start popping flashes with mirrors everywhere!! I didn't have a clue about how to get out of this mess (well, actually I did as it turns out), but I held my head high and acted like I knew what I was doing. Thankfully the Realtor didn't catch on, or follow me from room to room, and I finally regained my composure by the end of the shoot. More on this story with the final image I presented to the Realtor coming soon. I chose the photo below as a plug for the pole aerial photography article I'm writing up now. I thought this photo was more dramatic due to the height attained by the use of the pole, rather than the eye-level shot I also took, which I'll share with you in the article. 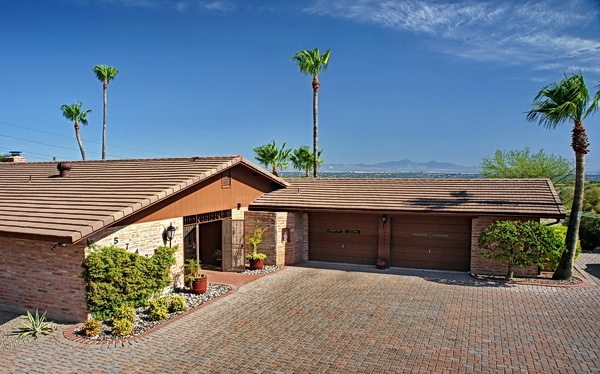 Although this image shows a lot of roof, the valley below and mountain range are now visible, highlighting the views from the back of the house. This was not achievable at eye-level at this position. The camera height is around 15' (4.6m) from the ground, taken with a 24mm (equiv) lens with polarizer, and using the long corded remote to fire the shutter. Attention; I've starting a blog, and it's basically a twin of this site, but will allow you to post comments, which I can't do with this site because it's based on 1990s technology. The new blog is called Sonycameragear.com. You'll find the same homepage stuff listed at both places, although I'm not sure if I'll add more to the blogger site or not, so please bookmark both. This new site is just up and running, so I'd appreciate it if you would go ahead and try out the links and comments etc and we'll see how it works. I disabled the comments for older entries because, well, they're old, and who cares about yesterday's news right? Actually, I was playing around practising adding new posts, so the newest 2/7/11 entry is the one we'll start off with. Also, the "add comments here" link (below) goes to the blog, then you can comment if you like. Too many complaints already. Problems with signing up and membership issues. I then allowed anonymous users to post, but on second thought, I'm going to hold off for now. Here are some camera/lens price updates you may be interested in; the Sony A900 is $2499.99 with instant savings, I think that's the same low price is was during the December sale. 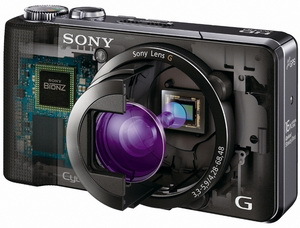 The Sony NEX-3 with 16mm lens is $499.99 until 3/5/11. A couple of days ago I mentioned getting the Sony microphone if you like shooting video with your NEX camera, well, it's been discounted even more, now at $81.00 (until 2/12/11), down from $93.00 in the past few days, that's weird. 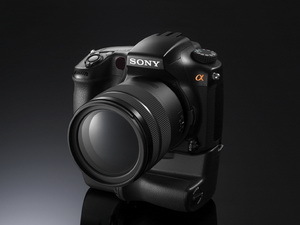 Also, the Sony A33 is being offered at $599.99 body only until 3/5/11. One last item of significance is the Tamron 60mm F/2 macro lens; $389 after mail-in rebate, that's $100 off the retail price, offer expires 4/30/11. I'm hoping to review that lens in the near future. Many people are speculating that Sony is trying to reduce inventories of these items in anticipation of new model releases, but that's total BS, as Sony has claimed nothing new in those categories will be released until this summer at the earliest. I'm getting quite a few messages from people wanting to know when I'm going to review some of the new after-market lenses, like the A005 Tamron 70-300mm F/4-5.6 DI VC USD (supposedly as good as the Sony 70-300mm G lens), or the Sigma 70-200mm F/2.8 EX DG OS HSM that just had a rather large price reduction, from $1699 to $1399 now. The short answer is; I'm not sure, but I definitely want to review those two lenses along with several others!! The new Tamron 70-300mm is still not available for Sony due to a heavier demand than anticipated, at least according to the Tamron website---read: filling orders for Canon and Nikon first. I'm hoping I can review the Sigma 70-200mm soon, and compare it to the Sony 70-200mm F/2.8 SSM, along with an after-market tele-converter like Kenko etc. Also, Sonyalpharumors is claiming to have a pretty solid fix on the highly anticipated A77 SLT. Look for an announcement in the near future, followed by a late-summer release date. This will be the loooooong awaited A700 replacement camera! Sony announces (actually leaked weeks ago) the DSC-HX9V and DSC-HX100V with 1080P HD video and both seem to offer about what you'd get with the newest Sony SLR/SLT and NEX cameras, although with small sensors and built in lenses. Sony has put a Carl Zeiss label on the big 27-810mm super zoom lens, so I wonder how that will test? I noticed they forgot to put a hotshoe on top, like Olympus did with their XZ-1 below. Neither camera is available now, and I won't be reviewing them, but I'm sure Dpreview have both in pre-production form, and will have a review posted in a few days.